After becoming a huge impact in both the music and gaming industries, it seems only logical for your next move to be into the fitness sector, well that’s the view Kai and Charles Huang had anyway. The two co-creators of global gaming chain Guitar Hero have created a new company under the name of Blue Goji. 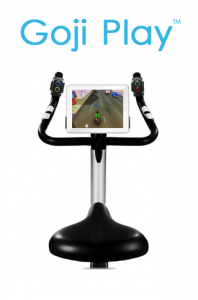 Kai and Charles Huang have used their successful backgrounds in gaming development, along with some clever usage of bespoke hardware to assemble a range of entertainment games suitable for people working out on cardio machines: exercise bikes, treadmills and cross trainers. The first product to be released is Goji Play, a double set of controllers, which attach to your cardio machine and an activity sensor you clip to your lower body. Goji Play connects wirelessly to a series of iOS apps, which in turn transfers your workout data to replicate the games input, i.e. speed for racing games. Kai and Charles decided to move into the health and fitness market; after they saw the effect that the Guitar Hero series had on a large proportion of the market and thought that the addictive interaction could be replicated into getting people fitter. With the constant dark cloud looming over the youth obesity crises, this could be a great opportunity to convert many young people to living a healthier lifestyle. With the incentive of completing games dependent upon how hard you workout it could really prove to be a game changer in this so called pandemic. The fact that Goji Play comes as a separate product and not integrated to a exercise machine, also makes the costing much more justifiable at $99.99.